Due to my overall busyness and absent-mindedness this week I forgot to replenish the listening material in my car, so, instead of what I really wanted to listen to, I was stuck with a number of albums which for some reason after many starts and stops I still was not able to get into. 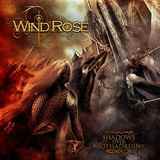 Italian Wind Rose with their debut Shadows over Lothadruin was one of them riding with me for a while now. Almost twelve months now to be exact, waiting for just this very chance. Meanwhile, I heard that this young band was actually getting their name mentioned in the power progressive circles, so faced with a dearth of new music on another long trip I dug in deeper hoping this time Shadows over Lothadruin will click. Setting aside a discussion whether Wind Rose is a masculine, metal enough moniker for a band, the Italians would have been a perfect fit on LMP Records years ago, from the label which brought us Rhapsody. Not taking a symphonic road with their music, Wind Rose nevertheless present an obvious fantasy concept story, trying to take a Blind Guardian approach on Nightfall in Middle Earth. In a similar fashion Wind Rose connect their bigger main pieces with a series of quick narration or mood setting moments. Unfortunately, those quick interludes actually do not do many favors to the album, and, honestly, detract more than anything. Still, on the concept album with a storyline, those step asides would have been easily forgiven, if the main attractions were gripping enough. And while the overall effort can be definitely classified as “pretty good”, Wind Rose is no afromentioned (early) Rhapsody, Blind Guardian or, the band they remind me the most of, Symphony X. Fitting with the progressive crowd, Wind Rose present pieces long and sometimes even monumental (Majesty), change parts from flowing softness to plodding pretense of heaviness (The Fourth Vanguard, Close to the End), provide for some knee-jerking syncopated rhythms (Endless Prophecy, Led by Light) and have a more than capable vocalist in the person of Francesco Cavalieri. Instrumental proficiency, however, is not what gets me sold on albums like this. Instead of riffs epic, grandiose and memorable at the same time, Wind Rose often prefers going on forays where guitars lose themselves noodling along with keys splattered over the top. Oath to Betray, in this regard, is more focused than The Fourth Vanguard or Majesty, because the latter one, honestly, you can’t just wait for it to come to resolution of one sort or another. Progressive portions of Shadows over Lothadruin missing me with their hooks, I was able to relate better when Wind Rose took on a folkier connotations. Sirtaki moments in Oath to Betray, heroic colored Led by Light, Wind Rose finds their footing on those songs, sounding in part like Skylark arriving to the knight’s tournament in Siderion. Not escaping the almost expected balladeering with Son of a Thousand Nights and Moontear Sanctuary, at least those beat up, tried and true moments let Cavalieri shine some more. Even if Shadows over Lothadruin came with a 20 page multi-colored booklet detailing the story, I have a feeling I would have struggled getting through anyway. This one is the like that book in the bookstore that has a very attractive cover, and everybody who is an expert says it has to be on a bestseller list, but you feel it is actually hard work flipping the pages getting all the way to the end. There are no obvious flaws with the storyline, yet it simply does not draw you in and becomes a page-turner at 2 am in the morning. Hopefully, the sequel, if one is made, would be more riveting.